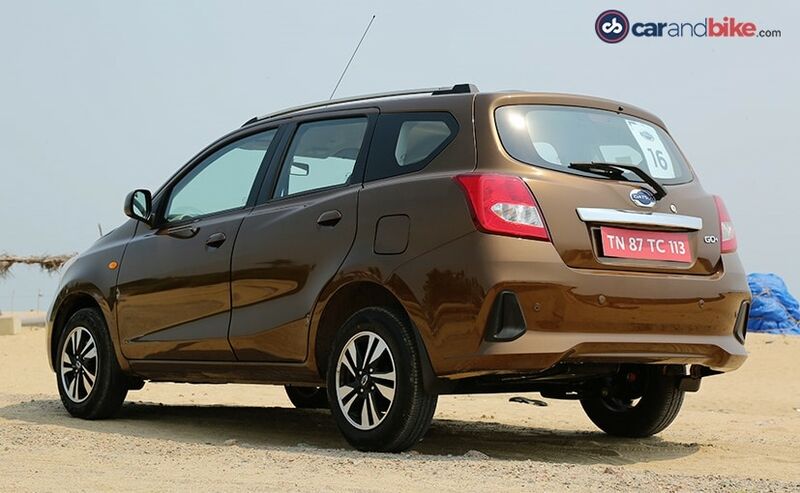 Datsun GO and GO+ have finally received a facelift for the Indian market, and we recently got to drive both the cars. We got to drive both the cars on the traffic-laden streets of Chennai as well as along the beautiful East Coast Road (ECR), and here's our experience. The success of the Datsun redi-GO was truly an eye-opener for the Nissan-owned Japanese carmaker. 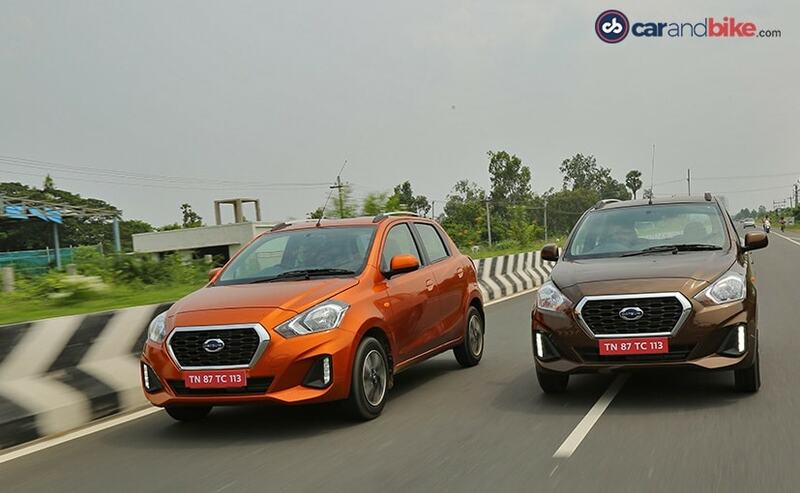 The company saw that car buyers are more than willing to choose a Datsun model as long they get a trendy looking car, with all the modern creature comforts. 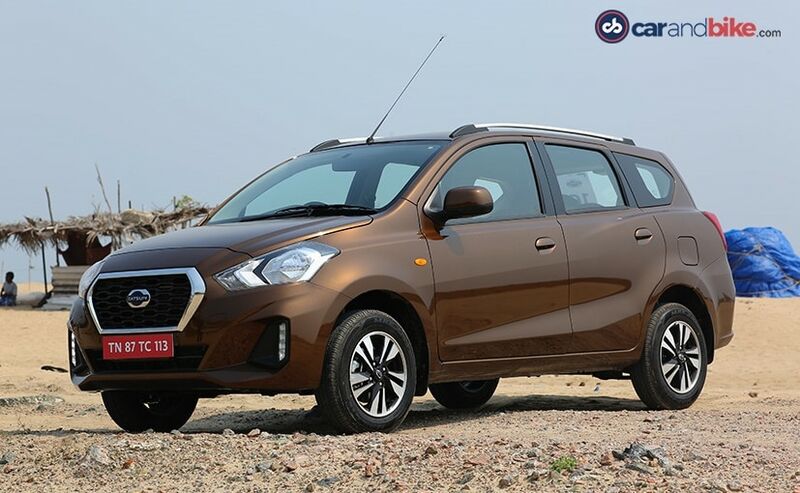 Now, it was time for Datsun to apply the same formula to the GO hatchback and GO+ MPV, which have not received an update ever since their launch in 2014 and 2015, respectively. 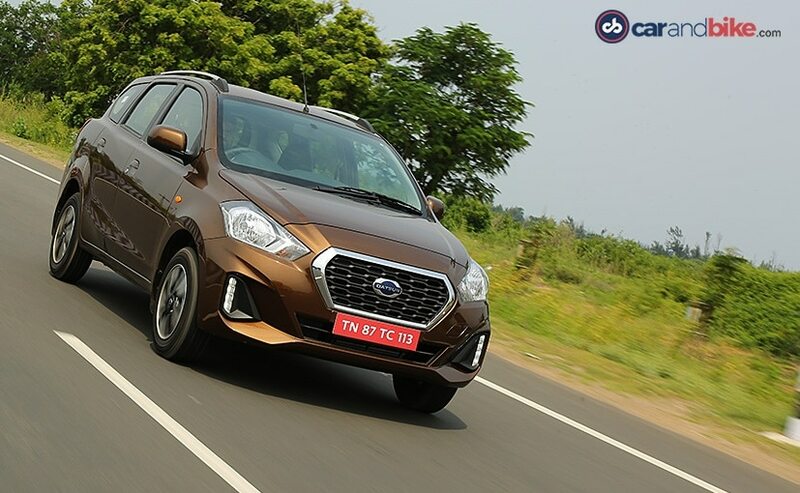 Yes, Datsun has finally launched the facelifted 2018 GO and GO+ in India and we recently got to drive both the cars on the traffic-laden streets of Chennai as well as along the beautiful East Coast Road (ECR), and here's our experience. Now, both the GO and GO+ were already built of Nissan's versatile V platform that also underpins the Micra, so under the skin, nothing has changed. What has changed though is everything above it. 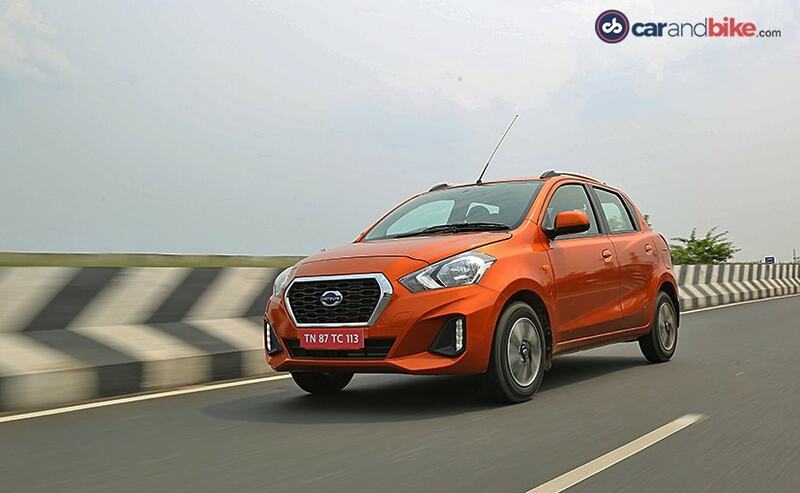 Datsun has given both the car a complete makeover inside-out with a bunch of cosmetic changes, along with several new features. Starting with the exterior, the cars now get a heavily updated face, which like the pre-facelift model, is identical for both the GO and GO+. There is a new, larger hexagonal grille with fat chrome surrounds, while the new sweptback headlamps come with styling black highlights. The front bumper is all new and comes with some bold muscular lines, along with some sharp scooped out sections that house the new LED daytime running lights. The cars have also grown in size, and the facelifted GO in particular is now longer by 3 mm, wider by 1 mm, and taller by 17 mm. Similarly, the GO+ is now wider by 1 mm and taller by 17 mm, although the overall length of the MPV remains under the 4-metre mark at 3995 mm. Both the car continue to come with the same 2450 mm wheelbase, however, now they sit a little higher with an increased ground clearance of 180 mm. This has been facilitated by a set of larger 14-inch 5-spoke diamond cut alloy wheels, which we have to say give the cars a much more imposing stance. Both of them, now also come with a pair of large and quite functional roof rails. Walk towards to rear and you'll start noticing the actual difference between the GO and the GO+. The latter, which gets an extended rear section, features a slightly flatter tailgate with the number plate and chrome slat above it, along with a well-sculpted bumper with trapezoidal inserts on either end. The GO hatchback at the same time comes with a new slightly curvier tailgate with a completely different rear bumper that also houses the number plate and comes with carbon fibre treatment for the lower section. However, both the cars come with similar wraparound taillamps, with integrated turn single lights. Step inside and you'll be welcomed by a heavily redesigned cabin equipped with premium quality plastics and smart-looking upholstery. We were given the top-end models with the optional interior package featuring black faux leather upholstery with orange accents for the GO and silver accents in the GO+. Both the GO and GO+ get an identical dashboard design with the only difference being an all-black treatment for the former and a dual tone black and grey treatment for the latter. 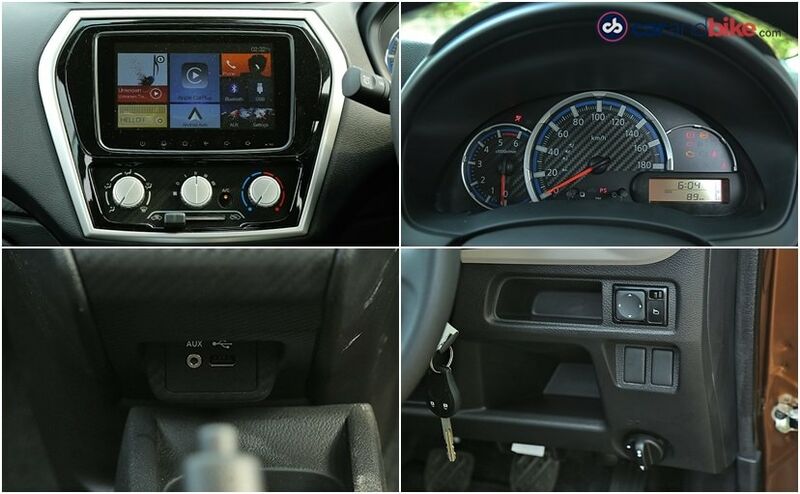 Datsun has also added some carbon fibre elements which can be seen on the dashboard, centre console and door panels. The cabin layout also remains unchanged with a standard five-seater format for the GO, while the GO+ continues to feature an additional third row, which in my opinion is still only suitable for maybe 2 children or to get some extended boot space with the third row folded. 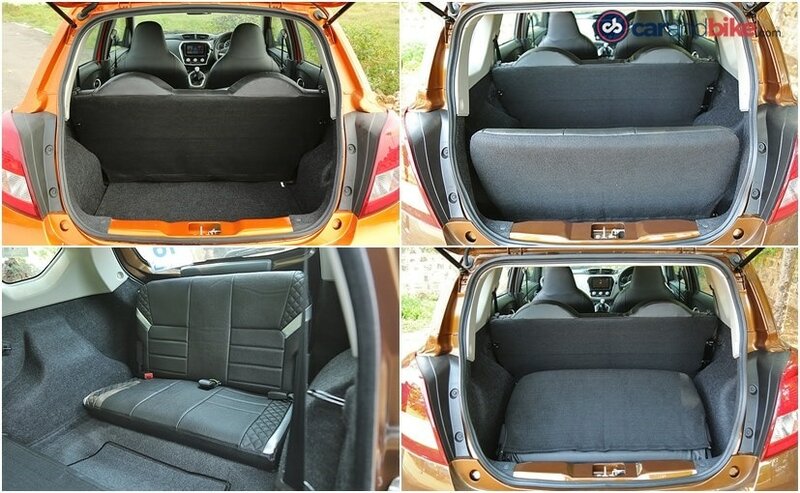 The GO offers a luggage space of 265 litres, while the GO+ (with the third row folded) offers 347 litres of boot space. 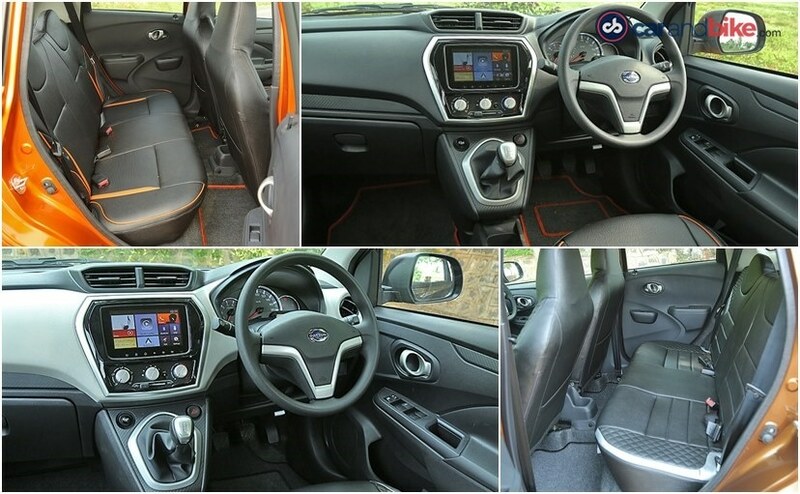 The 2018 Datsun GO and GO+ also feature loaded and the biggest addition is the brand new 7-inch touchscreen infotainment system sourced from Blaupunkt. The system features both Apple CarPlay and Android Auto, along with Google maps navigation, voice recognition, HD video playback, and Bluetooth connectivity among others. The cars also feature a new, more informative instrument cluster with trip computer MFD (Multi-Function display), which also gets the carbon fibre treatment. The cabin will not just keep you entertained but also safe as now, the carmaker also offers a host of safety features like dual front airbags, ABS (antilock braking system) with EBD and brake assist, along with reverse parking sensors, all as standard. This especially is a big step from Datsun, which in the past has been widely criticised for offering cars with poor safety standards. 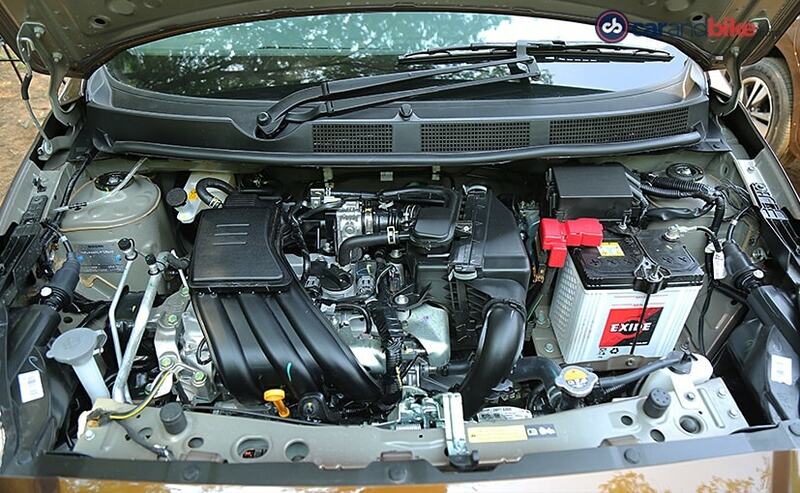 Powering both the Datsun GO and the GO+, is the same Nissan Micra-sourced 1.2-litre, three-cylinder petrol engine as before. The 1198 cc motor continues to offer the same output of 67 bhp and develops a peak torque of 104 Nm while being mated to a 5-speed manual gearbox as standard. The engine feels quite peppy and eager especially around the city when driving through lower revs, which means there is a good amount of low-end torque, however, once you hit an open road and try to push the car further there is a noticeable lag, especially above 2800 rpm, but the car's eagerness returns once you cross the 4000 rpm mark which indicates that most of the power is concentrated a little higher in the rev band. However, by this time you start to hear all kinds of noises from the road, from the tyre, and even the engine, which shows poor NVH levels of the cars. Another thing that kept on bugging me was the gearbox, which was a bit clunky and there was this occasional doubt whether the gear has been slotted in the right position or not. Here, we wish Datsun had worked on making the gearbox smoother and the shifts a bit more precise, because driving through city traffic with such a gearbox could become irritating after a while. Having said that, the ride quality of the cars, both the GO and GO+, has improved a lot thanks to the new suspension set up, which helps the cars tackle all the undulations on the road pretty nicely. 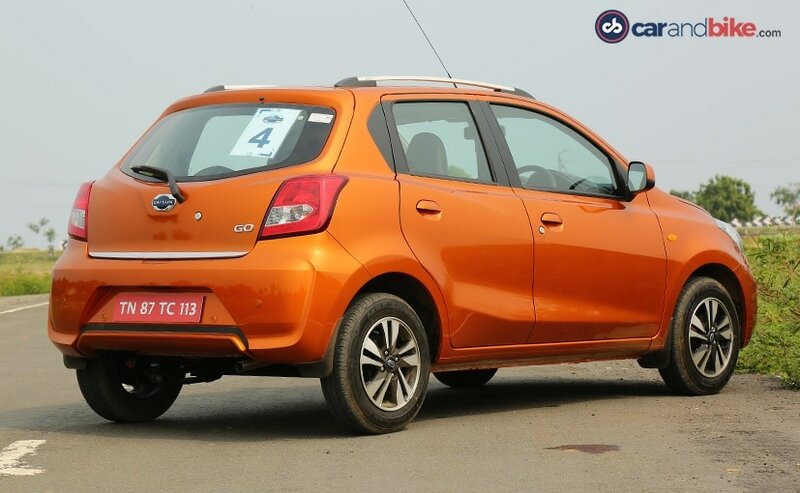 With the prices starting at ₹ 3.29 lakh for the Datsun GO and ₹ 3.83 lakh for the GO+, there is no doubt that the cars make a strong case for themselves, especially the GO+, which is still the most affordable 7-seater in India. Moreover, the cars come with a bunch of new features and creature comforts that make them a much better package compared to the pre-facelift models. Well, there are certain creases that Datsun still needs to iron out, especially if it wants the GO siblings to do some damage to its competitors' numbers. 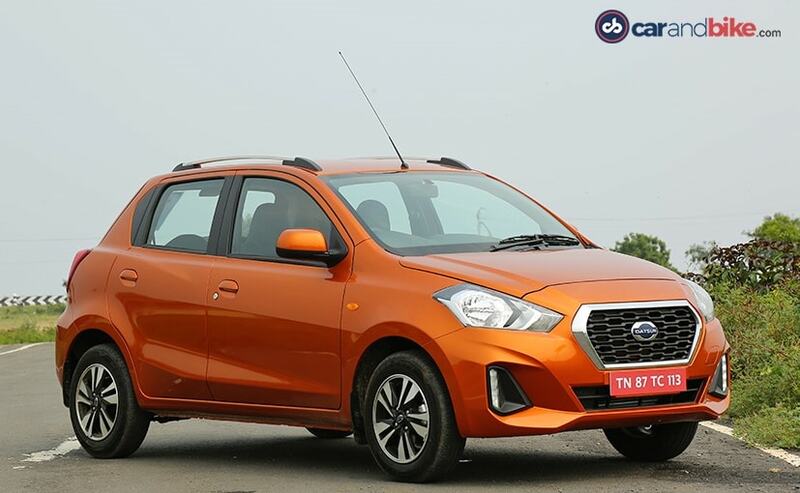 However, the biggest problem for the Datsun, especially the GO hatchback, right now is the soon-to-be-launched Hyundai Santro, which is expected to be priced very similarly and will be at par with it in terms of features and equipment.